Pre-bake tart shell. Reduce oven heat to 300°. Make custard by whisking together cream, eggs, creme fraiche, thyme and lemon zest in bowl. Season with salt (about 1 teaspoon); set aside. Heat medium saute pan over medium-high heat; drizzle in olive oil. Stir in onion; saute 2 minutes, until just beginning to turn golden. Stir in asparagus; saute for a minute, just until it turns bright green. Transfer to bowl; mix in roasted pepper. Season to taste with salt & pepper. Sprinkle asparagus mixture into pre-baked tart shell; sprinkle salmon on top. Pour custard into shell, filling to top, and place in oven. Bake until custard is set, about 40 minutes. Transfer to cooling rack. To serve: toss greens with desired amount of caper vinaigrette; divide between 8 plates. 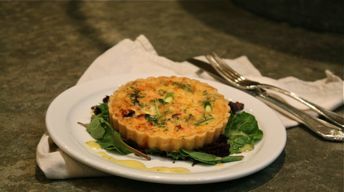 Slice quiche and serve alongside the salad. Extra vinaigrette may be drizzled around the plate for lovely presentation. Combine flour, salt, pepper and butter in bowl of a food processor; pulse ingredients until butter is incorporated -- take care not to over-mix. Add egg, and mix until the dough just begins to ball up. Turn dough out onto a floured work surface and form into a disk. With a rolling pin, roll out the dough to a 1/4-inch thickness. Line a 10-11" tart pan. (Note: there may be left over dough.) Line the pastry with foil and fill shell with pie weights or dried beans. Place in oven. Bake until pastry is set and golden brown. Transfer to cooling rack, remove pie weights and foil. Let cool completely. Put mustard, capers, shallot, and vinegar in blender. Turn blender on. While machine is running, slowly drizzle in the olive oil just until combined. Transfer vinaigrette to small bowl and season to taste with salt & pepper.